In the last article you have seen an introduction to reactive extensions and how it can simplify programming, especially when you want to observe data that comes to you. As an example, you can be observing events or notifications, periodic information and so on. You have seen that you can combine different sources of information using LINQ operators and obtain new information from it. And how do this relate to the UI of an application? There is a lot of relation, for example – the UI sends asynchronous signals to the back end (mouse events, keystroke events, change of data, commands activated, etc), that can be observed in a detached way, so you can separate the UI and the processing of the signals, thus getting a more testable program and (this is very important nowadays) a backend that is not tied to a specific UI, thus making easier to develop cross-platform applications. ViewModel – This layer makes the mediation between the view and the data. ViewModels change the data in a way that it can be shown in the View and receive the updates from the UI and pass them to the model. All this is done using the XAML infrastructure, mainly Data Binding and commands. The ViewModel is not tied to the View, so it can be completely testable and can be used in multi-platform programs (a single ViewModel can serve Views for different platforms). On the other side, the View usually isn’t tied to the ViewModel, so you can have many Views for the same ViewModel or many ViewModels for the same View. The Model also isn’t tied to the ViewModel, so it can be used independently of it (in fact, many developers create their models in an independent assembly, to emphasize decoupling). <TextBox VerticalAlignment="Center" Margin="5" Grid.Column="1" Grid.Row="0"
<TextBox VerticalAlignment="Center" Margin="5" Grid.Column="1" Grid.Row="1" VerticalContentAlignment="Center"
Content="Sign In" Grid.Row="2" Grid.Column="1" Width="65" Height="30"
<Border HorizontalAlignment="Stretch" VerticalAlignment="Stretch" Background="#40000000" Grid.ColumnSpan="2" Grid.RowSpan="3"
This window has two textboxes to enter the username and password (I should use a PasswordBox for the password, but I’m making it a textbox, so I don’t have to work with SecureStrings), a button that will be used to proceed with the login, and a border that will be shown when the login is processing. The ViewModel is derived from ReactiveObject, which will implement the INotifyPropertyChanged interface to notify changes. The core of the ViewModel is in the constructor, where you set the commands and the subscriptions. In this ViewModel we have created a canLogin Observable, that will emit a value every time the UserName, Password or IsBusy has changed. It will emit a true value when IsBusy is false and both the UserName and Password have values. Then we create a LoginCommand, that will execute DoLogin when triggered and will only be active when canLogin emits True. 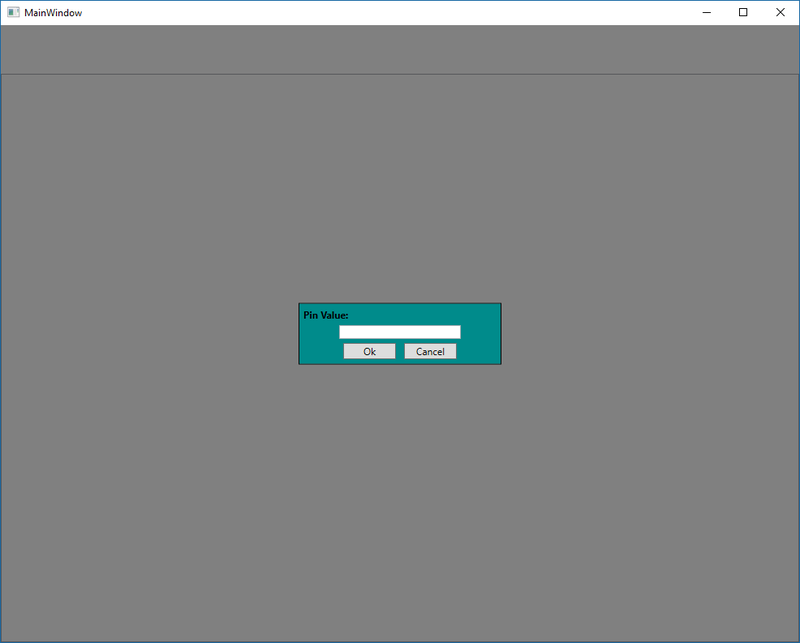 Then, run the program again and fill the values until the button is enabled and click the button, so the login is triggered. 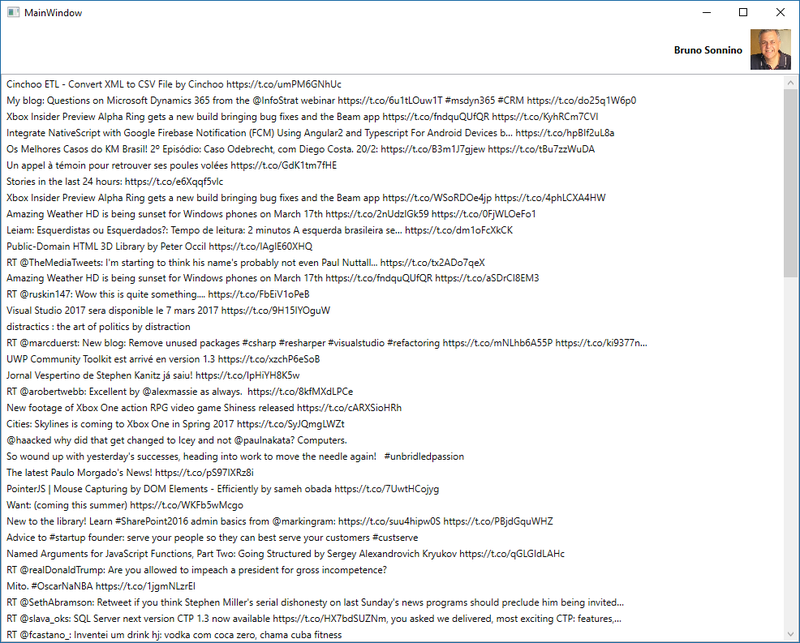 After that, you can end the program and open the tracepoint window by clicking the number of trace messages in the bottom of Visual Studio window. You will see something like the figure below. In the first line, I am still entering the UserName and canLogin emits False. As soon as I enter the first letter in the password (fourth line), canLogin starts emitting True and the button becomes active. 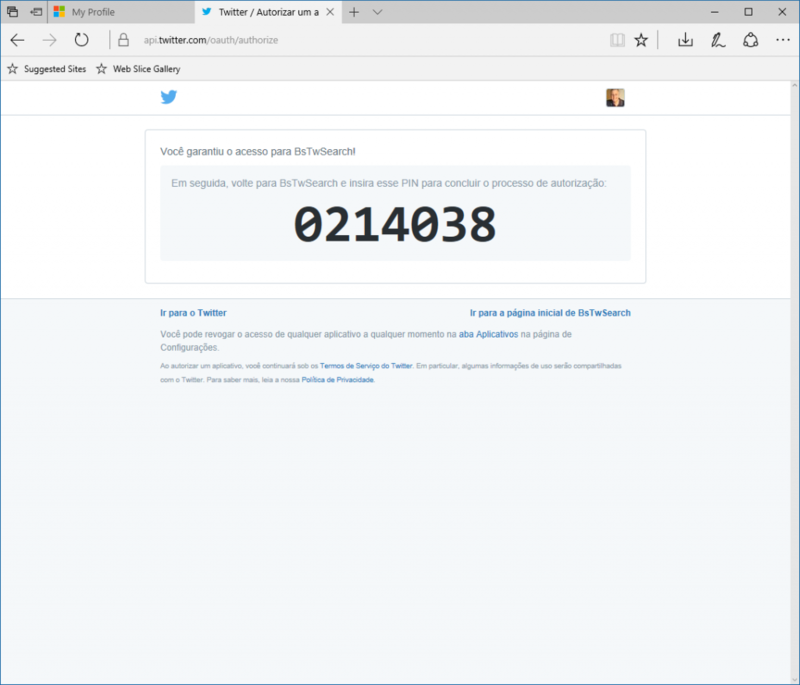 In the fourth line counting from the bottom, I click on the SignIn button and IsBusy becomes true, thus making canLogin to emit False. When the login is completed, IsBusy is set to False and canLogin emits True again. As you can see, everything was set up in the constructor and the observables emit the correct values while things are happening in the UI. Very cool, no? 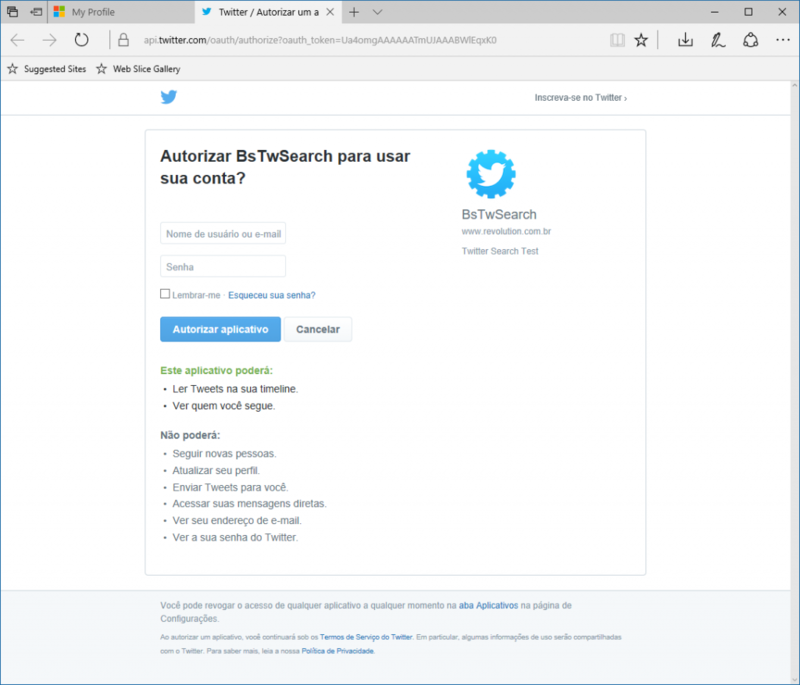 Now we can create the program that works for us (ops, out fictitious character) when procrastination mode is on: the automatic Twitter updater. With that, we can start creating our Twitter app. 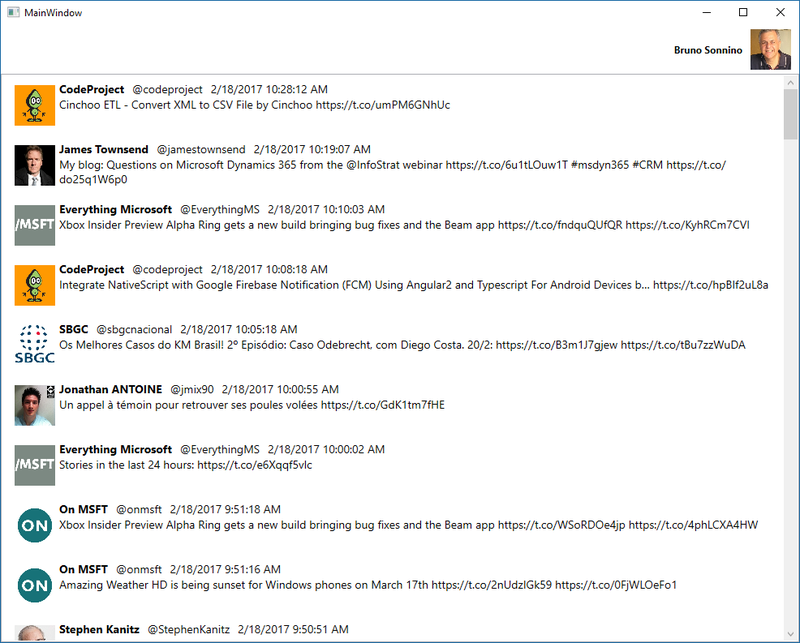 Create a new WPF app in Visual Studio and call it “ReactiveTwitter”. 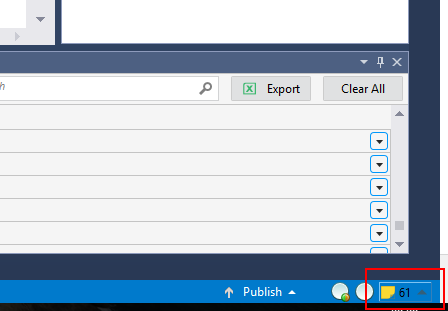 In the Solution Explorer, right-click in the References node and add ReactiveUi and Tweeinvi. Tweetinvi (https://github.com/linvi/tweetinvi) is an open source library to access the Twitter API. 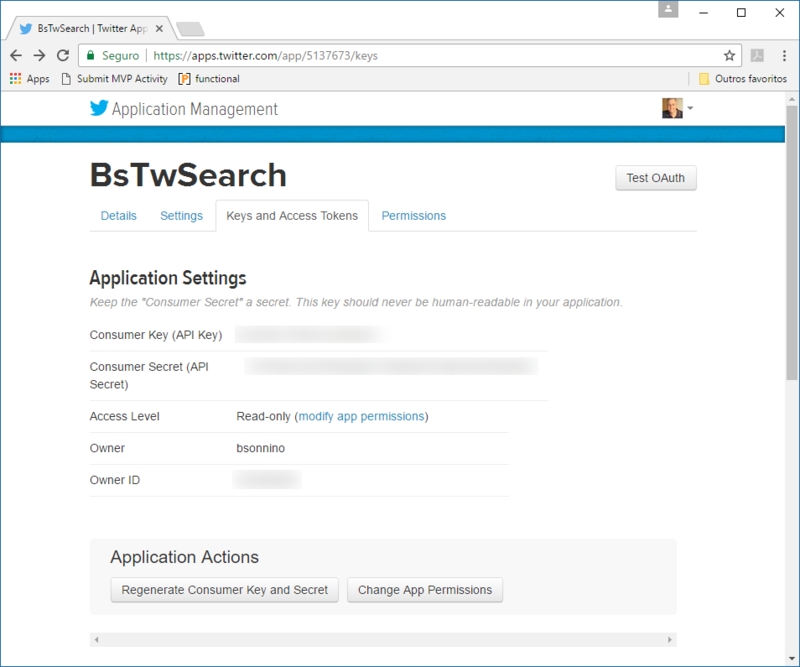 For desktop applications, the best way to authenticate is to open a web page where the user gives access to the app and gets a pin code. This pin code is entered in the app and, with that pin code, the app can get the client’s key and secret. The first method, AuthenticateUser, will do the first step of the authentication: with the Consumer key and secret, it will get the url to get the authorization and open it. Before that, the method checks if there are any saved credentials (in my case, I saved them as plain text in a xml file, but you should encrypt this in real usage). If there are any saved credentials, the app will use them to login and the method will return. If there aren’t any saved credentials, the method will show the authorization page. The second method, CreateAndSetCredentials, will get the pin code that was given to the user and use it to create new credentials and save them in the xml file. The ViewModel starts creating an observable that will call AuthenticateUser and will return if the user was already logged. If the user is logged, it will initialize the user data and will start getting the user’s timeline. If not, it will set IsGettingPin to true and then it will initialize the two commands needed for getting the pin value. SetAuthenticatedUser will set the user data and create a new observable that will fire every 15 seconds and will get the user timeline. Presto! No need to refresh anymore! This window has two parts: the second part is a grid used to get the pin number. It has a textbox and two buttons, where you can confirm or cancel the pin number. This grid is only visible when IsGettingPin is true. That why we set IsGettingPin to true when the user is not logged in and reset it to false when the user clicks any of the buttons. The first part is where the data will be shown: the logged user name and image and his timeline. The user’s data is filled at start and the tweet list is filled every 15 seconds. As you can see, using ReactiveUI makes it very simple to make your ViewModels reactive, with very few code you can create a program that shows your timeline, refreshing it every 15 seconds with no need of manual refresh. Problem solved! Now, back to work!